FREE Colgate Toothbrush w/ Coupon! 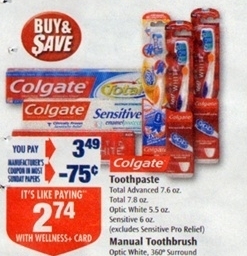 You can score a FREE Colgate toothbrush at Rite-Aid this week by using a few coupons! NOTE: The coupon I got in my paper was for $0.35 off, making it $0.14 instead of free, but that's still an awesome deal! Thanks, My Frugal Adventures for the deal and photo! This is a good give away. Perfect for March oral month. I would like a travel electric tooth brush.